← Aufruf zu Aktionen des zivilen Ungehorsams: Block Ramstein! To provide information and highlight the major aspects of NATO. The North Atlantic Treaty Organization (NATO) is a political and military alliance between several North American and European countries. Its basis is the North Atlantic Treaty that was signed on 4 April 1949. NATO is an alliance of member states who agree, under Article 5 of the Treaty, to mutual defence and consider an attack on one member to be an attack on all – but although they are obliged to respond, they are free to choose how. Its mission was described succinctly by Lord Ismay, the first Secretary General of NATO, as: “keep the Russians out, Americans in, and Germans down”. 2. Who are Members of NATO? Albania, Belgium, Bulgaria, Canada, Croatia, the Czech Republic, Denmark, Estonia, France, Germany, Greece, Hungary, Iceland, Italy, Latvia, Lithuania, Luxembourg, Montenegro, the Netherlands, Norway, Poland, Portugal, Romania, Slovakia, Slovenia, Spain, Turkey, the United Kingdom and the United States. 3. Where are the NATO Headquarters located? Headquarters are located in Belgium at Haren, Brussels, while the headquarters of SHAPE, the Supreme Headquarters Allied Powers Europe, NATO’s Allied Command Operations (ACO), has been located at Casteau, north of the Belgian city of Mons, since 1967. Although SHAPE has retained its traditional name referring to Europe, it controls all NATO operations worldwide – the geographical scope of its activities having been extended in 2003. Similarly, the commander of ACO also retains the title “Supreme Allied Commander Europe” (SACEUR), and continues to be a U.S. four-star general who is also Commander, U.S. European Command. 4. How has NATO Developed? NATO’s 12 original founding member states were the U.S., Canada, U.K., France, Netherlands, Belgium, Luxembourg Italy, Portugal, Denmark, Iceland, Norway. Three more states (West Germany, Greece and Turkey) joined between 1952 and 1955 and a fourth (Spain) was added in 1982. NATO’s military structure was developed during the Korean War under the direction of two U.S. supreme commanders and the Cold War and the admission of Western Germany to NATO in 1955 resulted in the formation of the Warsaw Pact by the Soviet Union, Hungary, Czechoslovakia, Poland, Bulgaria, Romania, Albania, and East Germany in the same year. A bitter and dangerous rivalry between NATO and the Warsaw Pact developed. Military exercises and war games were held by both sides and were always viewed with suspicion by the other. On at least one occasion (NATO’s Able Archer exercise in 1983) a series of world events and the growing distrust almost led to a nuclear war. After the fall of the Berlin Wall in 1989, NATO became involved in the breakup of Yugoslavia – with the first military interventions in Bosnia 1992 – 1995 and later Yugoslavia in 1999. Following the collapse of the Soviet Union, relations were cultivated with former Warsaw Pact members Yugoslav Republic. Several joined the alliance in 1999 (Poland, Hungary, Czech Republic), in 2004 (Lithuania, Latvia, Estonia, Romania, Slovakia, Slovenia), 2009 (Albania and Croatia) and the newest, Montenegro, joined in 2017 – bringing the total to 29 states. Membership of the alliance has not always been popular – some Icelanders participated in a pro-neutrality, anti-membership riot in Reykjavik on 30 March 1949 following the decision of the Icelandic parliament to join. President Charles de Gaulle withdrew French forces from NATO command between 1959 and 1966 in protest at the strong role of the U.S. and U.K.. However, France returned to full participation in 2009. In 1974 Greece withdrew its forces from NATO command following an invasion of Cyprus by Turkey but they were readmitted in 1980. 5. What governs NATO Expansion? Provision for NATO enlargement is given by Article 10 of the North Atlantic Treaty which states that membership is open to any “European State in a position to further the principles of this Treaty and to contribute to the security of the North Atlantic area”. Any decision to invite a country to join the Alliance is taken by the North Atlantic Council, NATO’s principal political decision-making body. Only European states are eligible for new membership and approval is needed from all the existing member states. Ina ddition, every member state can put forward specific conditions that would need to be met. For example, Greece is blocking membership of the Republic of Macedonia’s due to a disagreement over the use of the name Macedonia. Similarly, Turkey opposes the participation of the Republic of Cyprus with NATO institutions until the dispute over Cyprus dispute is resolved. Currently, Bosnia and Herzegovina, Georgia, Macedonia and Ukraine are aspiring members. Future membership is also the topic of controvertial discussion in Sweden, Finland, and Serbia. In Ukraine , support and opposition to membership is split along broadly ethnic and nationalist lines. The incorporation of countries into NATO who were formerly Warsaw Pact members is the cause of much tension with Russia. NATO has a Membership Action Plan (MAP) which helps aspiring members prepare for membership. Participation in MAP requires annual reports on meeting key requirements to be presented. NATO. Currently Bosnia and Herzegovina and Macedonia have a Membership Action Plan. 6. How Does NATO make Decisions? The decision-making body of NATO is the North Atlantic Council (NAC), and representatives of the member states also sit on the Defence Planning Committee (DPC) and the Nuclear Planning Group (NPG). 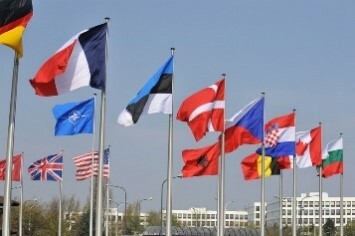 The Military Committee advises and assists NATO Council on military matters. The Secretary General of NATO directs the civilian International Working Staff who are divided into administrative divisions, offices and other organisations. 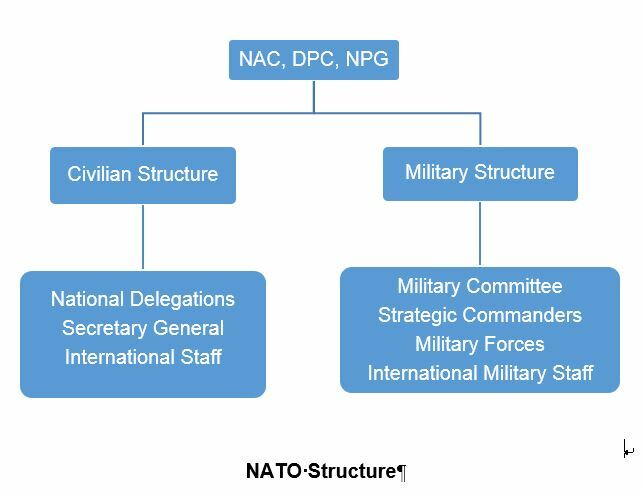 A number of committees that administer various NATO support agencies also operate throughout this structure. A “NATO decision” mutually accepted by all members is reached by consensus – NATO is an alliance of independent and sovereign states and there is no voting. To produce mutually acceptable results consensus decisions are made through a process of discussion and consultation based on the expression of national interests of the member countries. The North-Atlantic Treaty does not specify how decisions have to be made – except for under Article 10 where unanimous agreement is needed when inviting new members.Therefore, NATO relies on the customary practices it has developed over time. 7. When and How has NATO been involved in International Conflicts? NATO sees crisis management as one of its core tasks. It has assumed the military power to undertake crisis-management operations. This can involve military and non-military measures to address the full range of crises – before, during and after conflicts – as outlined by the 2010 Strategic Concept. Article 5 of the North Atlantic treaty, which requires member states to come to the aid of any member state subject to an armed attack, has only been invoked once – following the attacks in the U.S. on September 11, 2001. NATO led the International Security Assistance Force (ISAF) which was established by the UN Security Council and which deployed troops to Afghanistan. Since then the organization has operated a number of additional roles, including sending a training mission to Iraq (2004-2011); providing assistance in counter-piracy operations through “Operation Ocean Shield” (2009-2016 – NATO’s contribution to “Operation Enduring Freedom – Horn of Africa”) and enforcing a no-fly zone over Libya (2011). The Falklands War between the UK and Argentina did not involve NATO because, according to Article 6 of the North Atlantic Treaty, collective self-defence is only applicable to attacks on member state territories north of the Tropic of Cancer. The 2016 NATO Summit in Warsaw agreed to recognise cyberspace as “an operational domain, alongside air, land and sea”. Thus, cyber-attacks against NATO countries can potentially trigger an Article 5 military response (an attack on one country is an attack on all) – increasing the possibility of NATO taking collective military action. However, determining the source of cyber-attacks is not so easy and technical evidence of them is rarely shared or clarified. Article 4 – which calls for consultation among members – has been invoked 4 times by Turkey: once in 2003 over the Second Iraq War; twice in 2012 over the Syrian civil war and in 2015 following threats from Islamic State. 8. Has Russia shown interest in joining NATO? What happened? Russia has asked to join NATO several times. In 1954 the Kremlin asked to join NATO but was rejected – possibly leading to the formation of the Warsaw Pact (“Soviets tried to join Nato in 1954” and “Molotov’s Proposal that the USSR Join NATO”). A secret document revealed by Vladimir Putin in 2001 that the response from the West was that “the unrealistic nature of the proposal does not warrant discussion”. In 1991 President Boris Yeltsin asked to join NATO (“Yeltsin Says Russia Seeks to Join NATO”). In 2000 President Vladimir Putin also asked to join (“Putin’s Labyrinth”) and asked again in 2003. He wanted to join as one of the first-tier members like Britain, France, and Germany, and not as one of the new Eastern European countries – but it never happened. 9. Does NATO work with other States? Yes, in various ways. Despite its “North Atlantic” name, for over 25 years NATO has been developing a network of partnerships with non-member countries from the Mediterranean,the Gulf region and elsewhere. There now are nearly non-member 40 states that work with NATO, on a variety of issues of common interest, such as preparing for, or being part of, NATO-led operations and missions; collecting and sharing information; researching into weapons technologies; etc. Through programmes such as the Euro-Atlantic Partnership Council/Partnership for Peace, the Mediterranean Dialogue and the Istanbul Cooperation Initiative. NATO’s “Partnership for Peace” (PfP) is a programme that builds relationships with partners through military-to-military cooperation and helps build closer relationships with NATO. 21 states are members in Europe, Scandinavia and the former Soviet Union. NATO has also been working with the African Union (AU) since 2005, when it provided support to the AU mission in Darfur, Sudan – the first NATO mission on the African continent. Currently NATO is supporting the AU Mission in Somalia and a long-term peacekeeping capability – the African Standby Force. Four AU members (Algeria, Egypt, Mauritania and Tunisia) along with Morocco, are already in a NATO partnership program: the Mediterranean Dialogue – one of the two formal mechanisms for NATO interaction with countries in the Middle East and North Africa. The other is the Istanbul Cooperation Initiative. However, NATO officials and partner countries agree that neither initiative has been a great success. 10. How has NATO affected Military Spending? NATO has set a defence spending target for its members of 2% of GDP. However, only 5 nations are currently complying – the U.S., the U.K., Poland, Greece, and Estonia – with one other, Latvia, likely to reach the target in 2018. Even so, all the NATO countires together constitute over 70% of the world’s total defence spending. In the name of interoperability, NATO has also brought about a standardisation of allied military terminology, procedures, and technology – which basically means adopting U.S. practices. Over 1300 Standardisation Agreements exist and new countries are forced to become integrated and buy U.S. equipment. A fundamental part of NATO’s nuclear policy is its concept of “Nuclear Sharing”, whereby non-nuclear weapons member states are involved in planning for the possible use of nuclear weapons by NATO. They would also be involved in delivering nuclear weapons if necessary. Participating countries also host and maintain relevant equipment (e.g., nuclear-capable aircraft) and store U.S. nuclear weapons on their territory. In the event of war, the U.S. has informed NATO members that the Nuclear Non-Proliferation Treaty (NPT, signed by all NATO member states, which commits non nuclear weapon states never to acquire them or be involved in their transfer) would no longer operate. As a consequence of Nuclear Sharing, approximately 150 U.S. non-strategic gravity B-61 bombs are stored in six U.S. nuclear weapon facilities in five NATO countries: Belgium (10-20), Germany (10-20), Italy (60-70), Netherlands (10-20), and Turkey (60-70). Previously, it seems that the U.S. removed an estimated 130 U.S. nuclear weapons from the Ramstein Air Base in Germany in July 2007 and some 110 removed from RAF Lakenheath in June 2008 in the U.K. Currently the U.S. nuclear weapons stored in Europe are B61-3, B61-4 gravity bombs and the delivery systems are Belgian, Dutch, and Turkish F-16 bombers and German and Italian Tornados. However, the U.S. National Nuclear Security Administration (NNSA) is currently modernising these warheads, converting them to the more accurate updated and more ‘usable’ B61-12 version. Under NNSA’s B61-12 Life Extension Plan, the updated warheads will enter full production in 2020 and be deployed by 2024. Turkey, the Netherlands, Italy and possibly Belgium have plans to buy the nuclear-capable F35-A Joint Strike Fighter from the U.S., which will begin replacing the existing F-16 aircraft in 2024. Germany is expected to extend the service life of its nuclear-capable Tornado planes through the 2020s. 12. How does NATO operate in Europe? In 2014 the NATO Summit in Wales agreed a Readiness Action Plan (RAP) to “respond swiftly and firmly to security challenges from the east and the south”. A core feature of RAP is the 5000-strong Very High Readiness Joint Task Force (VJTF) created within the NATO Response Force (NRF). At Warsaw in July 2016, Heads of State and Government welcomed its implementation and introduced new work on NATO’s deterrence and defence posture. As a consequence, NATO Force Integration Units (NFIUs) have been established in Bulgaria, Estonia, Hungary, Latvia, Lithuania, Poland, Romania and Slovakia and a Headquarters for a Multinational Corps Northeast has been created in Szczecin, Poland and another for a Multinational Division Southeast in Bucharest, Romania. NATO will also continue to help further militarise the EU – which has been developing its own military since the Lisbon Treaty of 2009. The Secretary General signed a Joint Declaration with the Presidents of the European Council and the European Commission to take the partnership between NATO and the European Union “to a higher level”. 13. What about NATO and US Missile Defence in Europe? The US and NATO are also installing missile defence systems in Europe. When President Obama was elected to office in 2008 he shifted the emphasis of US missile defence from defending the homeland against ICBMs to defending military operations against regional battleground threats. This transition was to be carried out through his so-called “European Phased Adaptive Approach” (EPAA) involving the expansion of the ship-based Aegis missile defense systems and developing a land-based missile launcher (Aegis Ashore). The ‘Aegis Ashore’ system is composed of a vertical launcher and support facility, similar to that being used on ships and, in addition to the Aegis systems, the US army has developed its own land-based mobile Terminal High Altitude Area Defense (THAAD) system to be deployed against short and intermediate range missiles in Japan and South Korea. At its 2008 Summit in Bucharest NATO agreed to integrate components of the EPAA into systems that it was developing for theatre missile defence. This soon developed further and in Lisbon in 2010 NATO decided to expand the combined programme to cover European populations and territory with a command centre at Ramstein Air Base in Germany. In 2011 an agreement was made with Turkey to host a forward based X-band radar system at Kürecik which was then established the following year. The US also confirmed agreements to base 24 Aegis Ashore interceptors at the Redzikowo military base in Poland by 2018 and the hosting of US Aegis missile defense ships in Rota, southern Spain. In addition, the Netherlands decided to adapt 4 air-defence frigates for NATO’s Ballistic Missile Defense (BMD) capability. From 2018 all four Royal Netherlands Navy Air Defense and Command Frigates (ADCF) will be fitted with SMART-L radars to enable them to detect and track ballistic targets outside the earth’s atmosphere for other NATO missile defense components. 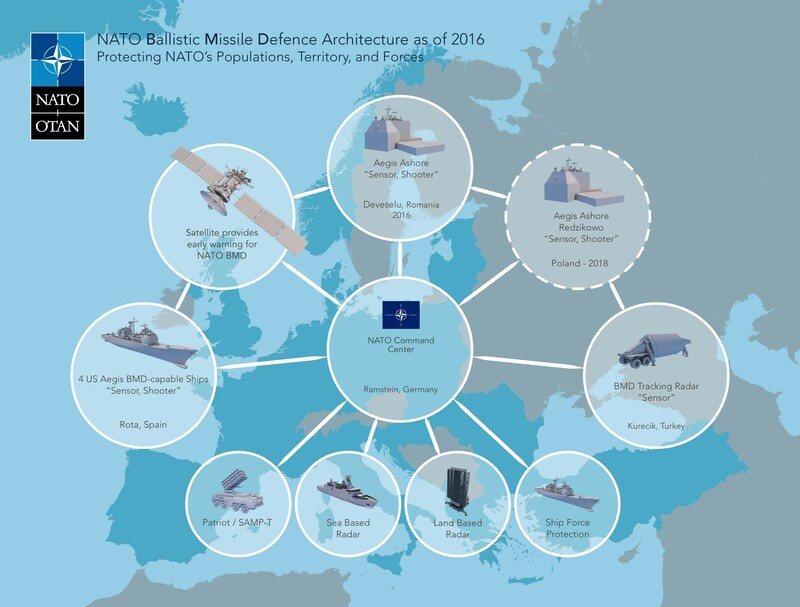 In 2012 NATO announced that a BMD command and control centre had been set up at Ramstein and the US established the Aegis Ashore Naval Support Facility in Deveselu, Romania in 2014 which was activated in 2016 and the NATO BMD system was declared operational. Russia has always been particularly concerned about these activities and claims that the activation violates the 1987 INF treaty – a claim that has been dismissed by the US. There has also been heavy criticism about the viability of the system in reports by the US Defense Advisory Board in 2011 and the Government Accountability Office and the US National Academy of Sciences in 2012. The US has ignored all criticism and a 1990 agreement with Russia not to push NATO further east after the reunification of Germany, and placed missiles in former Warsaw Pact countries. Russia is uneasy about the destabilising nature of these moves and the build-up of NATO troops on its doorstep. President Putin believes that the purpose of missile defence is to downgrade the Russian nuclear deterrent by disabling its ability to retaliate to a US nuclear first strike on Russian missile silos. A response from the few remaining missiles not destroyed in a first strike could be readily ‘mopped up’ by even a limited missile defence system. Russia is particularly concerned about the stationing of missile defence systems along its borders and has repeatedly asked for legally binding assurances that NATO missile interceptors would not be used against Moscow’s strategic missiles. However, Washington is unwilling to do this. Russia has therefore reacted by deploying short range Iskander missiles in Kaliningrad, close to the Polish border, as a counter measure and this is being used to justify the increase in military activity by the US and NATO both sides and a serious escalation around the conflict in Ukraine. 14. How does NATO operate in Scandinavia? NATO is also very active within Scandinavia. In February and March last year, NATO held its annual 2 weeks of high intensity operations in Norway, entitled ‘Exercise Cold Response 2016’. It included land, sea and air mobilisations, with military contributions from 12 NATO members and 2 partner nations. 15,000 troops took part from (among others) Sweden, Finland, Denmark, Latvia, Poland, Germany, France, Britain, Canada, Belgium, Spain and the Netherlands. The increasing frequency of exercises such as this has led to the US establishing storage depots for tanks and amphibious assault vehicles in Norway. Scandinavian countries are slowly but surely remilitarising. In July 2016 the Swedish government signed a host nation support agreement allowing NATO to operate more easily on Swedish territory for exercises or in the event of war. In September, Sweden announced it was remilitarising the Island of Gotland, located halfway between Sweden and Latvia in the middle of the Baltic Sea, re-establishing a permanent garrison there in April. There are also calls for NATO to militarise the Åland Islands, a group of Finnish islands which have been demilitarized since the 1856 Treaty of Paris marked the end of the Crimean War. Also, an unofficial agreement between Denmark and the Soviet Union that Bornholm Island (briefly occupied by the Soviet Union at the end of World War II but returned it to Denmark in 1946) would not be used by NATO is also being questioned. In September 2017 the Aurora military exercise was the largest military exercise in Sweden in more than 20 years, The US will be practicing how to move a Marine Corps brigade from Trondheim, Norway to Sweden in the event military tensions escalate in the Baltic region. An advance guard of US Marines are already being established in Trondheim. War fighting is not just about tanks. Today the military depends on space power. Military commanders and decision makers require information and control – information about targets, troop movements, the weather, etc. and control of the movement of military components, ships, tanks, personnel, drones, etc. and today military operations are informed by and controlled through satellite systems that provide space power – technologies for surveillance, communication, global positioning, targeting, guidance and remote drone operations. The western governments and media continue to claim that the increase in US and NATO military activities and the establishment of bases along eastern European and Scandinavian borders is “in response to Russia’s actions in Ukraine and Kaliningrad“. However, Russia sees NATO and the US pushing military bases and escalating aggressive military exercises ever closer to its borders – despite past promises that it would not go there. 15. What are NATO links with the UN? Three NATO members (the United States, France and the United Kingdom, all nuclear weapon states) are permanent members of the United Nations Security Council with the power to veto decisions. A framework agreement for NATO-UN cooperation was proposed by NATO Secretary General de Hoop Scheffer in September 2005. Previously, the UN Secretary General‘s High-level panel on threats, challenges and change (HLP) explicitly referred to NATO – UN cooperation. Its December 2004 report stated, that “[i]n the case of NATO, there may also be a constructive role for it to play in assisting in the training and equipping of less well resourced regional organizations and States.” However, in its follow-up report, “In larger Freedom” UN Secretary General Kofi Annan also highlighted the importance of formal cooperation with regional organisations without particular mention of NATO. So far, the 2005 NATO-UN cooperation framework agreement has not been officially introduced, as it lacks approval on the UN-side because of the widely perceived concern that NATO is a military arm of the U.S.
16. How does the anti-war movement see NATO? Numerous anti-war groups demand that NATO leaders to be charged with sponsoring and carrying out war crimes. In his writings, Gerald Perreira, who served as an executive member of the World Mathaba based in Tripoli, refers to NATO as the “North Atlantic Terrorist Organization” describing them as neo-colonial enforcers on a global crusade. Protest marches and rallys are held on the days leading up to the NATO Summits whereever they are held. Marches and counter summits against NATO actions and “peace camps” are also organised. Protesters believe that NATO activities such as military exercises and missile defence installations are a major contribution to a new Cold War and a new Arms Race. NATO has carried out wars, aerial bombardments and armed drone operations in Iraq, Afghanistan and Libya to bring about a change of regime but all of these countries are now in chaos with thousands killed and many more made homeless and destitute with little help for their well-being. Since the end of the Cold War, NATO has searched new missions and attempted to reinvent itself as a tool of the ‘international community’ to safeguard ‘freedom and security’. However, peace activists see NATO primarily as a vehicle for US-led use of force in the interests of the rich and powerful, accelerating militarization, by-passing the United Nations and the established system of international law, and escalating military spending. The network ‘No to War No to NATO’ believes that we should stop NATO. There are various ways to do this: leaving NATO by §23 of the NATO constitution; forcing an end to NATO by a collective decision of the NATO governments; or by developing a new security system in Europe which includes Russia (a common or collective security).